In this article, we will take a look at some common mistakes that developers new to Node.js often make, and how they can be avoided to become a Node.js pro. For the past few years, Node.js, accounting for its growth and popularity, has been a talking point for some time now. Well-establish companies like **Walmart and PayPal **have adapted it, making it one of the most recognized languages at present. 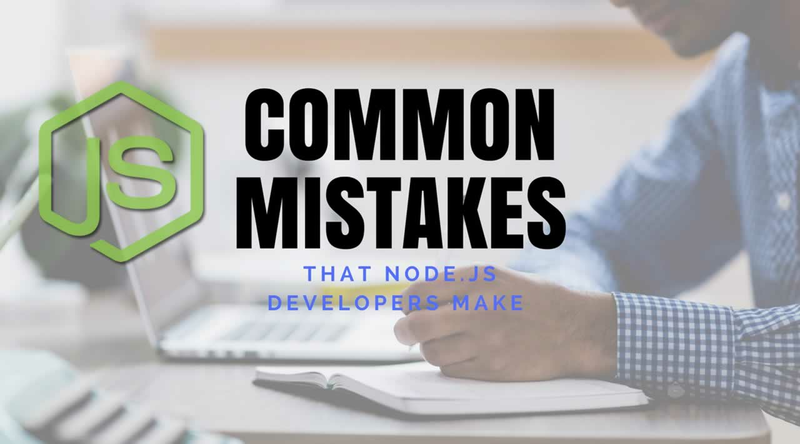 However, as many other platforms, Node.js faces a lot of development problems that includes crucial mistakes committed by the developers themselves. As you will notice, calling the “testTimeout” function will first print “Begin”, then print “Waiting…” followed by the the message “Done!” after about a second. Often confused for testing, profiling is a completely different process. Profiling information helps with program optimization by studying various aspects related to the program like its space or function return time.In Node.js applications, profiling will help you understand things like delay in the event loop, system load, and CPU load or memory usage. The developer should know that if any change is done at the source, he has to restart and also he needs to refresh the browser when the static codes are getting modified and affecting the performance of the application. For restarting the server, you can use modules such as nodemon and for refreshing the nodemon and livereload is regarded appropriate. Notice how there is a return statement every time “done” is called, up until the very last time. This is because calling the callback doesn’t automatically end the execution of the current function. If the first “return” was commented out, passing a non-string password to this function will still result in “computeHash” being called. Depending on how “computeHash” deals with such a scenario, “done” may be called multiple times. Anyone using this function from elsewhere may be caught completely off guard when the callback they pass is invoked multiple times. In many asynchronous functions, the return value has almost no significance, so this approach often makes it easy to avoid such a problem. Notice how we are treating “exports” as a property of the module object. The distinction here between “module.exports” and “exports” is very important, and is often a cause of frustration among new Node.js developers. If the callback to “db.User.get” fired asynchronously, the scope containing the try-catch block would have long gone out of context for it to still be able to catch those errors thrown from inside the callback. This is how errors are handled in a different way in Node.js, and that makes it essential to follow the (err, …) pattern on all callback function arguments - the first argument of all callbacks is expected to be an error if one happens. However, unlike arithmetic operators, bitwise operators and shift operators work only on the trailing 32 bits of such large “integer” numbers. For example, trying to shift “Math.pow(2, 53)” by 1 will always evaluate to 0. Trying to do a bitwise-or of 1 with that same large number will evaluate to 1. You may rarely need to deal with large numbers, but if you do, there are plenty of big integer libraries that implement the important mathematical operations on large precision numbers, such as node-bigint. Here, we fetch the image and simply pipe the response to the client. At no point do we need to read the entire content into a buffer before serving it. Regardless of whether your Node.js code is running in production or in your local development environment, a supervisor program monitor that can orchestrate your program is an extremely useful thing to have. One practice often recommended by developers designing and implementing modern applications recommends that your code should fail fast. If an unexpected error occurs, do not try to handle it, rather let your program crash and have a supervisor restart it in a few seconds. The benefits of supervisor programs are not just limited to restarting crashed programs. These tools allow you to restart the program on crash, as well as restart them when some files change. This makes developing Node.js programs a much more pleasant experience. All these tools come with their pros and cons. Some of them are good for handling multiple applications on the same machine, while others are better at log management. However, if you want to get started with such a program, all of these are fair choices.